Left: Pepsi launched a bold social marketing play, find out what went well –and what opportunities were missed. Greetings, fellow strategists, In my latest column for the Forbes CMO Network (you can read all my Forbes pieces) I analyzed Pepsi’s big push into social. Also, you should see my detailed field notes, (I did my research before, during, and after the game, thanks to Trendrr folks) to measure any specific changes, before coming up with my findings. I did contact Pepsi pre article to get comments, although they sent me an email after the Forbes piece was up, see bottom response. Cola maker should promote its social cause on TV. PepsiCo ditched the Super Bowl this year to make a major social media play. Instead of spending money for ad time on the Super Bowl, it’s relying primarily on digital initiatives to spread the word about its Internet-based Refresh Project contest and charity campaign. The cause-marketing effort is a good one. Word is spreading through traditional media, online networks, social media and celebrity chatter. But I believe Pepsi made a big mistake in giving up its long-held Super Bowl ad real estate. A more integrated media approach–one that included the Super Bowl–would be a savvy play for Pepsi. And such integration is something top marketing executives need to keep in mind in their rush to embrace digital initiatives. Let’s take a look at Pepsi’s campaign playbook. Pepsi, as a major ad player, knows that brand association is key to its marketing strategy. Company executives also know that there’s a shift in consumer adoption toward social technologies and that marketers can’t count on reaching the consumers they want to engage through TV. In response to this, Pepsi execs decided to spend the money the company typically plows into buying and creating Super Bowl spots–$20 million or so–to promote and fund a campaign that will identify causes that are worthy of supporting. At refresheverything.com Pepsi encourages consumers to submit ideas to improve community or causes then activate their personal networks to vote for the ideas. To date, the number of submissions possible for the first round of awards has been maxed. It also enjoys a continuous buzz on Twitter with the hashtag #PepsiRefresh. Pepsi has a lot of things going for it. It has the deep pockets to keep a campaign going long-term. It has benefited from notable press buzz from being the first mover of a radical approach. Additionally, the company is using traditional media outlets to glean endorsements from celebrities, including New Orleans Saints quarterback Drew Brees on NFL.com. His charity of choice: the American Cancer Society. Pepsi made a misstep in this bold media shift: The company alienated a key channel and missed out on tying Pepsi Refresh to the most-watched TV event in Western media (correction to “U.S. Media” see comments below for details). By not having any in-game discussion on the advertisements, it was unable to use the Super Bowl or its advertisements as a catapult to launch the campaign into the social sphere. In fact, after the game, overall mentions of Pepsi and the Pepsi Refresh campaign remained relatively on the same trajectory as before. To look at a detailed set of my field notes and data, I’m tracking mentions using Trendrr of blog posts, Tweets and news articles on my field notes page. First-mover advantage. 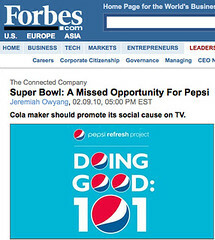 By announcing a radical approach Pepsi took advantage of pre-event press coverage (including a story in Forbes). Using celebrities to spur campaign. Pepsi invested in influential relationships by the utilization of celebrity endorsements. Shifting to “we” over “me.” Pepsi has shifted traditional brand advertising efforts to now being more community-focused, enabling those who won the monies to spread the Pepsi brand on their behalf. Planning for the long haul. Pepsi is making its marketing dollars go to work by extending the program over months, rather than a short flight of Super Bowl ads. Pepsi has yet to show the world it gets social marketing. Its recent entry into the space with the edgy–but sexist–“Amp” iPhone applications resulted in severe backlash, and is now a case study on the infamous punk’d list. Cultural mismatch. Pepsi’s history of mass marketing means it will need to change its internal culture to embrace social marketing, where success lies in letting go of control. Missed opportunity to integrate Super Bowl TV ads with campaign. Pepsi’s biggest misstep is putting all its eggs in one basket–and not benefiting from synergies of multiple channels. By shifting so much of its annual ad budget from one channel to another, Pepsi missed an opportunity to spur word-of-mouth chatter about its Refresh initiative. Instead Pepsi should have relegated an appropriate amount of TV advertising budget to Pepsi Refresh, encouraging submitting ideas, voting and sharing in the context of the game. It would also introduce Pepsi as a socially conscious marketer to a larger group of people. CMOs experimenting with digital and social technologies should not invest in them as a silo. They should instead be part of an overall integrated marketing effort. JKO: Below is Bonin Bough, Pepsi’s Social Marketing strategist response via email. He’s given me permission to publish the following, and I appreciate the time he took to respond in an active dialog. Bonin: I enjoyed reading your initial analysis of our Pepsi Refresh Project. Let’s me start by saying on your key takeaway, we are on the same page: An Integrated Approach to Media is Best. And that’s the approach we’re taking with the Pepsi Refresh Project. Throughout the course of the year-long initiative, we’re absolutely using traditional channels — television included — to support it. Our decision not to announce the program on the Super Bowl was not because we don’t believe in the power of television. We do. Or that we don’t believe in the Super Bowl, specifically. We do. (As you know, we chose to advertise other PepsiCo brands during the game.) The decision was based on the opinion that it wasn’t the most contextually relevant way to tell the story. Arguable? Perhaps. But the conversation around the program — the amount of it and the overall tenor of it — thus far suggests that it may well have been the right approach. But we’re going to continue to engage in, enable, listen to and evaluate the conversation. And if it seems that we need to course correct we will. A sign, I think, of an internal culture and a senior management that is embracing social marketing. Of course, the Pepsi Refresh Project is about more than marketing. It’s about engagement … about building affinity and building advocacy by making a real and measureable difference in people’s lives. And that’s why we take very seriously your point about impact. We’ve aligned with top-notch partners including GOOD, Global Giving and Do Something in building the Pepsi Refresh Project. A leading academic and research group will be assisting with project follow-up and measuring community impact. We’re optimistic about the very great potential. We’ll be watching and sharing as the ideas build, the stories unfold and impact becomes evident. I look forward to watching your analysis and continuing the dialogue throughout the course of the program and the course of the year. JKO: Thanks Bonin, we’ll continue to watch the interesting moves Pepsi is taking in the space of disruptive technologies. We agree, Pepsi’s core program is strong –but it can be refined by keeping all engines on –not putting all eggs in one basket. I appreciate the time you took to give me feedback. I’ll see you at SXSW again this year.